Been fulltiming in my RV with my husband, dogs and cat since 2013. Price reflects dry camping. W+E is $25. No sewer at sites; there is a dump station. Showers (2 count) are $3, change machine on site. Dirt/gravel parking lot with dry to the right of the shower/bath house and hook ups to the right. 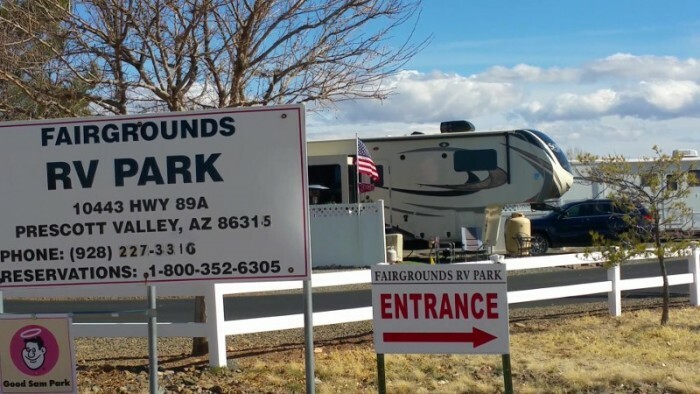 We camped at Lake County Fairgrounds in a Fifth Wheel. Prior reviews are consistent with my opinion. This place is big rig friendly. I wouldn't take our 35 ft fifth wheel into the depths of the park, but some hefty size ones are in there. From the intersection with 395 where the Mobile gas station (dump station) is located, go a bit further on 120 for a fresh water station on your left. There is a sign. 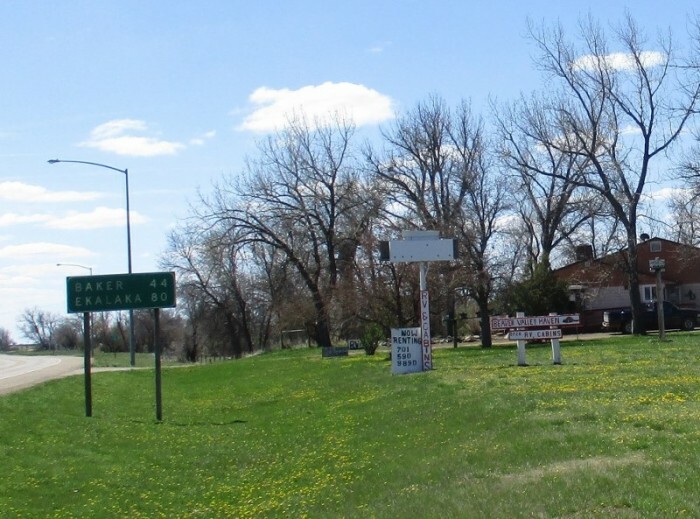 The campground entrance is 2.3 miles from 395 on your left. It is easy to miss. There is a generic camping sign but at this moment is partially covered by brush. Laundry ($2.50/$1) and showers ($3.50) are available at the Mono Visa RV Park. Propane fills are at the Shell gas station ($30! for 7 gal). We camped at Lower Lee Vining Campground in a Fifth Wheel. Shindig with live music at the Mobil gas station on Thursday nights and Sunday afternoons. Informative film at the Mono Lake Committee Info Center. Ranger programs available daily. Sites were very wide; the park was clean and quiet. All the hookups were in the back of the site. We had to buy $100 worth of sewer equipment to connect; we needed 30 ft total and they require all of it to be off the ground. They have cable, no wifi, 2 of the 3 washers were out of order. Only option for walking/jogging with my dog is to loop around the park which is about 1 mile. We found Prescott a cute town (~30 mins away) with great hiking. Others must feel the same which is why we had a hard time finding availability anywhere in the area. Felt ripped off when I saw that I was paying more for two weeks than the monthly rate of which there was no availability. Didn't appreciate neighbor flying confederate flag. 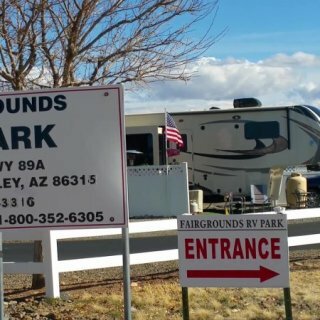 We camped at Fairgrounds RV Park in a Fifth Wheel. I found the All Star Laundromat to have more large capacity washers than the other local laundromat. I stayed here two years ago, prior to new management, and had positive memories of the place, quiet, nothing fancy, but that is what you get for cheap. This time around, with the increased price, the improvements I noticed were small dog run, mowed back yard to get an extra couple of feet of walking with the dogs, excellent wifi and cable. The downsides are back placement of sewer connection (bring 3 sections of hose if your drain is mid-RV); sewer connection is up hill; sites are uneven front-back & side-to-side; most sites are narrow (wasn't a problem years ago because few spots were occupied); our site had crushed rocks aka ankle twisters and a spattering of cement blocks (didn't even want to look out the window let alone sit outside); lots of bits of litter everywhere, lots of dog poop everywhere, laundry room was clean at a casual glance, but upon closer inspection could use a deep clean. (I didn't go in the bathrooms.) We camped at Tejas Valley RV Park & Campground in a Fifth Wheel. Prepare yourself for construction and heavy traffic on Potranco (all over the city, really!). At this time of year, the Lake Alice campground is the only one open for first come first served. We maneuvered our 35 ft Fifth wheel around the tiny campground and picked one of the few sites that we could fit in. Luckily, we had our pick as the only other camper was the camp host. Shower/bath house was open, but the one day we wanted to use it, it was closed; hours are 9- 4pm, closed for cleaning from 1-2 (I believe). Hike to the Visitor's Center and to the mines was ...invigorating (!) and educational. You can tell that the hiking trails were a result of blasting (vs. natural). We drove to the dam to hike the strenuous Wapiti trail. It wasn't that bad. It was more natural, but the trees were burnt. Personally, I liked the view of the lake from the lake trail than the top. No internet and no cell phone service (AT&T or Verizon). We camped at Sugarite Canyon State Park in a Fifth Wheel. Try out the brewery in town (Colfax Ale Cellar) on 2nd street. They have beer but no food. Bruno's Pizza and Wings will deliver to you at the bar. Just ask for the menu. Can't say much more than what the others have said. Rate reflects monthly rate. Wifi was great at our site which happened to be right next to the pole. Neighbors one site away from us and the pole, didn't have a good connection. Interactions with the guy that works in the office was hit/miss. When asking for information, he was allusive. We were shaking our heads when we left trying to figure out if he was trying to be funny or was having a bad day. When leaving, I went to settle the electric bill; I was told how much more I owed on top of the deposit. I was never given the itemized bill until after I was paid up. They charged me $0.16/kWh, but was told it was going to be $0.15. I didn't have it in writing, and didn't want to have to talk to him again. I am not a fan of being locked in a night, but found out that the neighborhood isn't all that safe. Also, didn't like the night lights; our windows with the shades down were glowing all night long. We camped at Deer Creek Valley RV Park in a Fifth Wheel. If you have guts, do the Capitol tour to the dome. Hike around Lake Shawnee, ~7-8 miles. If that is too far, at least, check out the gardens. Nice hiking trails @ Dornwood park (close to RV park) and @ Governor's Mansion (NW side of town). Nicer hiking trails @ Perry State Park, ~20 minutes. The public library is amazing. Get all the details about Brown v Board of Education historical site (for free). I especially liked the civil rights timeline that runs throughout the exhibit. I negotiated a rate for two weeks back in March ($350+electric - rate was $0.25/kwh. ). The grounds are treed, and clean. 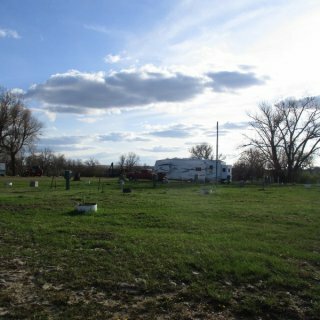 Sites are large with picnic table and a fire ring. We hardly ever have fires, but we did here. Nice quiet, chill kind of place. Loved to be able to cross the street to look at the lake. The hiking trails out back (got to look for them, no sign) go for miles in a wonderfully peaceful setting. My biggest problem is the water. It is orange (stained my shower) and stinks. Very glad we had a RO water system. Owner said to let the water run; it never cleared in two weeks. We were told we could have packages delivered. When none of our mail arrived, a trip to the P.O. revealed that they refuse to deliver here due to some dispute. Some packages happen to be sitting there, others were sent back. It is a bit run down. The theater, various other buildings, and additional sites are under construction which makes parts of it look messy. The fudge shop was closed. It is a good ten minute drive to downtown Marquette. We camped at Gitche Gumee RV Park in a Fifth Wheel. Sculpture park 4.5 miles to the east. Previous reviewer did a great job at describing my experience here. Wanted to give a more recent review to show that the place has not changed much, price went up some. We had an end spot that made it feel less cramped. We discovered people leave their RVs there and visit on occasion. Thus one of our neighbors was never there in the week we were there. So the only neighbor we had were behind us. We camped at Big Fish N Campground in a Fifth Wheel. Rate reflects weekly rate. The place was practically empty being pre-Memorial Day. Most others were on the FHU on grass; it was too crowded for us. The FHU on asphalt wasn't appealing. Tall grass spot with W+E with no one else near was our choice. They have a dump station. The grass around us eventually got mowed. These spots are very closely spaced and most were on a slope. No picnic table or fire ring. They said we could have mail delivered there, but UPS couldn't figure it out. Luckily we had a few days to resolve it by my going to UPS to pick up my package. They had a free concert while we were here. We camped at Illinois State Fair Campgrounds in a Fifth Wheel. 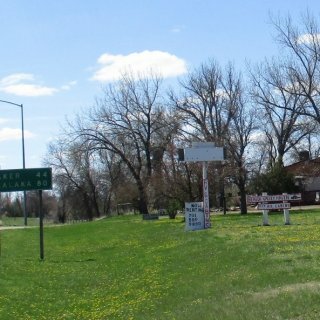 The location is perfect for visiting all the Lincoln related stuff in town. We walked the 2+ miles; 6th street is the better route. Lincoln park is an easy walk (take a right out of gate 10 or 11 and go one block). The Lincoln Museum was fantastic. We were told CG #3 had more space between sites; we did all the loops and were not pleased with our options. A CG #1 premium struck our fancy. Not that I wanted to pay the extra $2/night for 50 amps, but we needed to stay for a 3 weeks and I was being picky. I assume premium is for the 50 amp service; it is certainly not for the view of the lake. We could see bit and pieces of water through the leaves, not worth extra $$. Lake is down a couple of steep sets of stairs and then there is no access due to vegetation. Lots of trails running along the lake between the campground and the lake. It rained and the trails were still very wet 3+ days later. We ended up walking on the road a lot; there were a lot of cars passing us. Most were courteous, except for the one that almost ran me over. Beach is a good 20+ minute walk on the trails or on the road. From the beach parking lot, it is 127 steps down to the beach! Bathrooms were fairly clean, mostly bugs and webs; one time I did encounter a mess like the previous reviewer mentioned. I felt it pretty pricey for no sewer hook ups. They say it is $23 for camping, but you also have to add the $5/night fee for your vehicles and another $3 per reservation fee. The touristy part of Lawrence is at least 20 min drive. We won't forget this place for an RV caught fire and burned to the ground across from us (well spaced sites! we didn't have to move) and the folks at the dump station that dumped without use of a hose despite my offer to use my hose. I certainly hope your stay isn't as eventful. We camped at Clinton State Park in a Fifth Wheel. HyVee on Clinton Parkway is a pretty good grocery store and has recycle bins in the back parking lot. Norge Village Coin Laundry is the closest, but go the few extra blocks south to 31st St Laundry, much cleaner. There are many areas to this state park scattered around the lake, within the areas are multiple campgrounds. We sought out the Walnut River Area since we were told it blocks more wind. The campsites are a mix from primitive to full hook ups, first come-first served to reserveable, short term to long term. For as many options in camping, there are more in fees. There is a vehicle fee ($5/day), camping fee ($21 for E+W) and a transaction fee ($3). You can pay the flat fees or get a 14-day camping pass ($112.50) or a monthly camping fee ($225ish) and/or a year vehicle pass ($25). Ghez, so much work before even parking our rig. The woman at the booth was very pleasant to explain this all to us. We ended up in Big Oak campground which was nearly empty, very quiet, lots of big trees, on the river. We had a picnic table (out front) and fire ring and grill (out back?!) Loved the paved hiking trails since it was wet. If dry there were lots of dirt trails that I would have liked to explore. There is laundry, but it was very dirty. Like other reviewers mentioned, the showers were scary, relatively clean but no curtains. One opening had 3 showers in cluster...you'd have to see it to believe it. One of the toilets was on the ground, I assume in the middle of repair, but I didn't check in on the progress. We camped at El Dorado State Park in a Fifth Wheel. I agree with the previous reviewer about Central State Park. We had an option of 3 spots, the one that we figured we could fit in was very unlevel and filthy with foil on the grill, carpet in the fire pit. The picnic table was around back, no space out front; it was a drop down to the lake. Neighbors very close. They suggested we check out Scissortail Campground which is associated with Central State Park, a bit south off 15th Street. The campground is in a neighborhood (huge lots), but it is surrounded by woods that you would never know others were near by. There are 38ish large sites on the lake. There was no beach and no boat launch. There were bathrooms, the best shower that I have ever had (hot and powerful), and a playground. There were some horse trails off the entrance road, I am not sure how legit it was for us to use them. My husband took his bike out there and said they were pretty short (2 mi). You could see other sites, but they were pretty far. Water was same situation as central with having to run a hose for very long distance. I noticed those who got there first did put Y-connectors for others to tap into. Litter all over, we made our dog walks with trash bags, so hopefully you won't notice as much. :) Very quiet and peaceful. Also the price was cheaper at $25 wkend, and $20 weekday. We stayed a week and got one $20 night free. Lots of birds, ducks, geese, deer; we were very happy that we choose this place. There is a dump station. The web site says premium sites are $5 more, premium is with water view. We found it breezy by the water during this time of year and that in-land was better. We camped at Central State Park at Lake Arcadia in a Fifth Wheel. All prior reviews reflect what we discovered. They installed new power pedestals with 50amp. The water is two below ground spigots for sites to share; they are very far away from the sites. A bit tight maneuvering to get our 35' fifth wheel in, but doable. Sites are not very level. We wanted to stay hooked up for pending storms, but it would have been way off level to stay hooked up. Very nice 10 mile trail around the lake. Disc golf and boat ramp on site. Clean enough when doing a drive by, but lots and lots of bits of trash everywhere. The bathrooms were a single pit toilet with no door, not for the faint of heart. 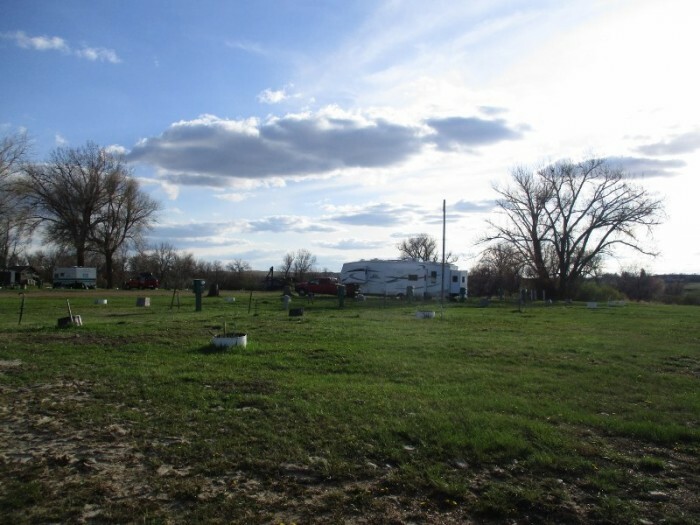 We camped at Elk City Lake Park Campground in a Fifth Wheel. National Route 66 Museum (one of a set of museums) in town. Surprisingly good restaurant choices. We had an excellent meal at Prairiefire. And a very good experience at Roma's Italian, a better dining experience than the exterior and interior would otherwise suggest. Besides being a mostly open dirt/gravel parking lot, we got a warm welcome from the other campers, a very friendly chatty group. I think the owner fosters this environment, he was a card. It was quiet. Hook ups worked as expected. No picnic tables, but a few cable spools that you could roll over to your site. We camped at Bosque Birdwatchers RV Park in a Fifth Wheel. Right outside the Bosque Del Apache National Wildlife Refuge. Dogs are not allowed in the refuge, but we noticed a trailhead prior to the refuge sign. There was no sign saying no-dogs so we were able to do a nice hike in the area.